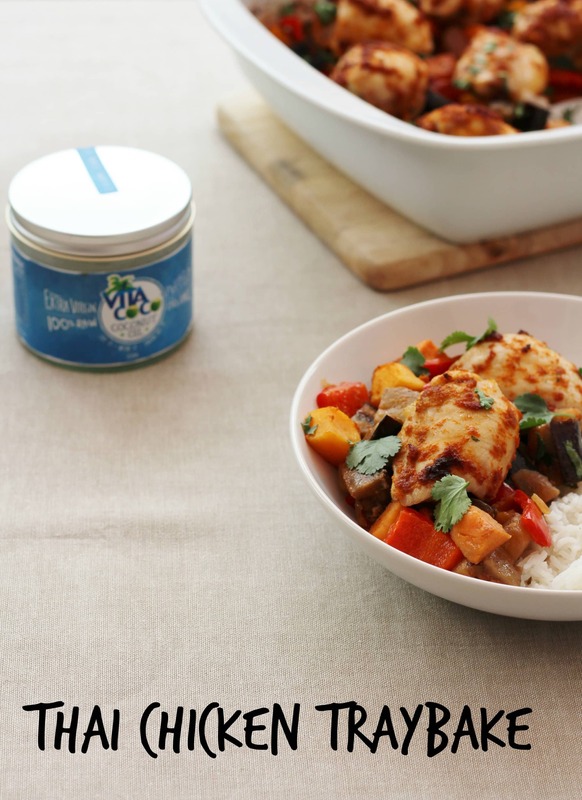 A new twist on an old favourite – this time it is the turn of a Thai Chicken Curry to get the traybake treatment – with the help of some Vita Coco Coconut Oil. Hailed by many foodies as a wonderfood, Coconut oil is simply oil extracted from coconuts and is believed to have many health benefits. It can be used in cooking, but also as a beauty product on both your hair and your face. 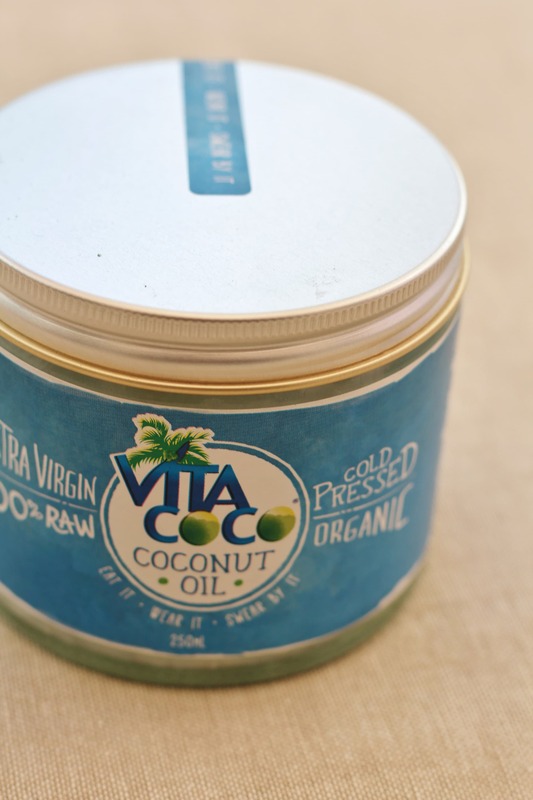 Vita Coco Coconut Oil is raw and vegan, so it is particularly good for people who prefer to eat raw foods or avoid animal products. It also has a high smoke point, so won’t burn if you want to cook with it at high temperatures. Being a food blogger, I was obviously most interested in the taste! 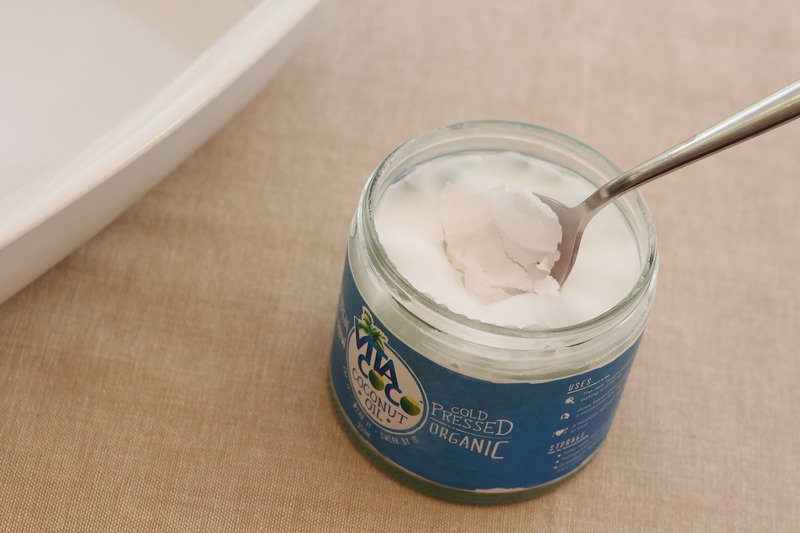 Coconut oil is usually a solid, white fat (though it melts at 23C, so it’s a liquid at temperatures higher than this) and tastes quite a lot like coconut milk – though a bit milder and more greasy. It gives food cooked with it a lovely, subtle coconut flavour, but doesn’t dominate. Its subtle coconut flavour means it’s great for using in cakes and other desserts, instead of butter or margarine, but it can also be used in savoury cooking and particularly lends itself to Asian style dishes where a delicate coconut flavour really works well. Actually Coconut Oil rather neatly solved a problem for me – I had been toying with the idea of a Thai chicken traybake for ages, but I wasn’t quite sure how to inject the coconut flavours you’d normally find in a Thai food into a traybake without turning the traybake into a curry (with coconut milk) or a dessert (with desiccated coconut). Coconut oil seemed like the perfect solution. Not only did it provide the flavour I was missing, but it was a much better choice for roasting than olive oil (my usual cooking oil), which tastes all wrong with Thai food. 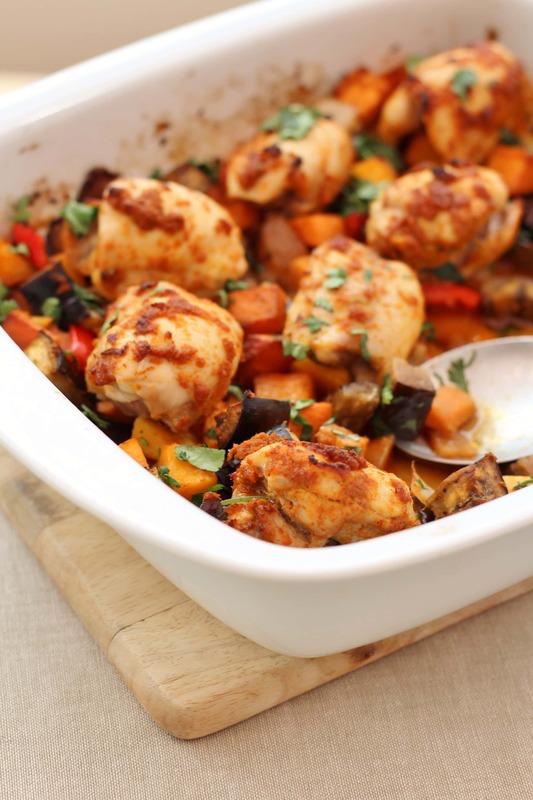 That conundrum solved, the rest of the dish came together really easily – I took some of the flavours I might usually use in a Thai red chicken curry – red curry paste, chicken, aubergines, red peppers and butternut squash – and recreated them in traybake form. I started by melting some coconut oil in a large tray in the oven and then tossed the veggies in the oil and put the tray back in the hot oven to begin roasting. I then melted a little more coconut oil and mixed it with a couple of tablespoons of red curry paste (I used Thai Taste). 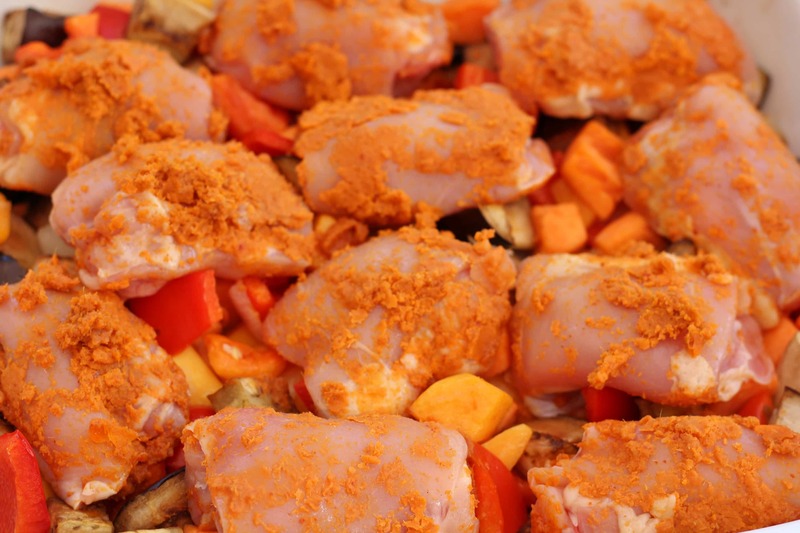 I used this mixture to coat the chicken thighs, which I then popped on top of the veggies and cooked them in the oven for a further 30 minutes. Finally I sprinkled the dish with fresh coriander and served it with rice. To make my life even easier, I used a ready prepared bag of diced onion, butternut squash and sweet potato, but you could chop these yourself, if you prefer. 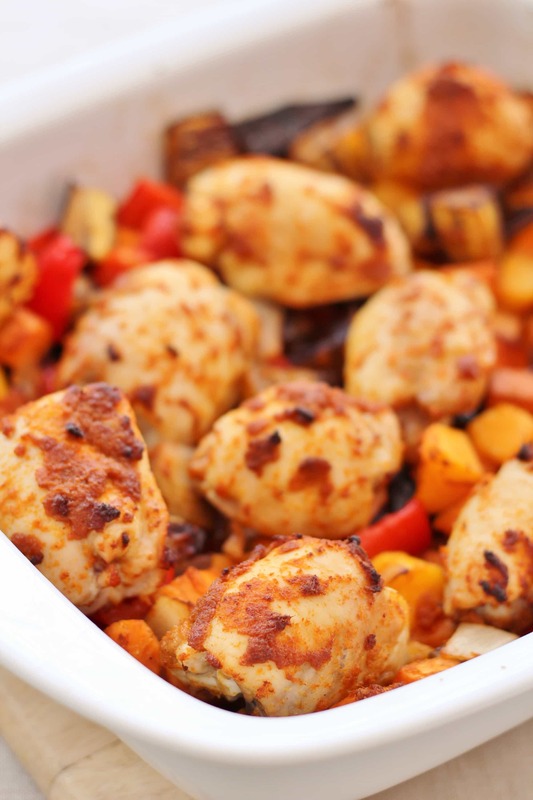 I chose to use chicken thighs as they are less prone to drying out than chicken breasts and I prefer the flavour, but this dish can easily be done with chicken breasts instead if you want to – allow one chicken breast per person. The fragrant, aromatic flavours in this dish would go beautifully with an aromatic wine such as a Gewurztraminer or Riesling. 2 tablespoons red Thai curry paste I used Thai Taste. 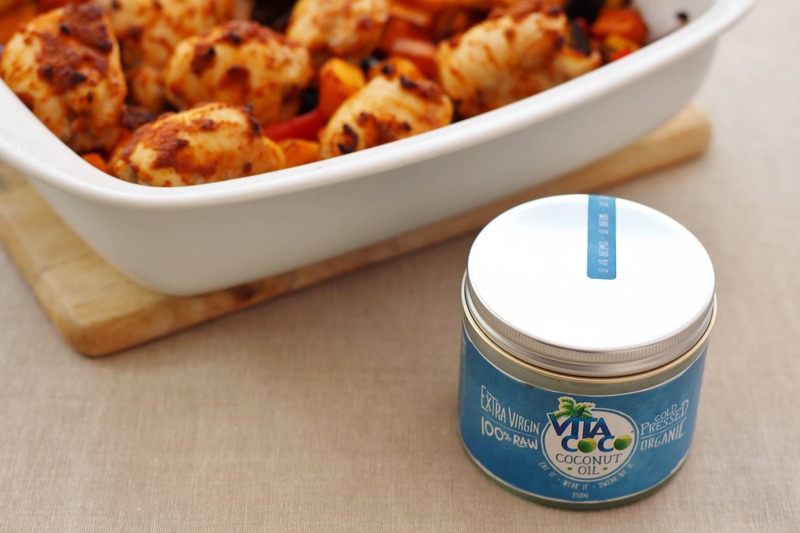 Put 2 tablespoons Vita Coco Coconut Oil in a large roasting tray and put the tray in the oven to heat up. Meanwhile prepare your vegetables. 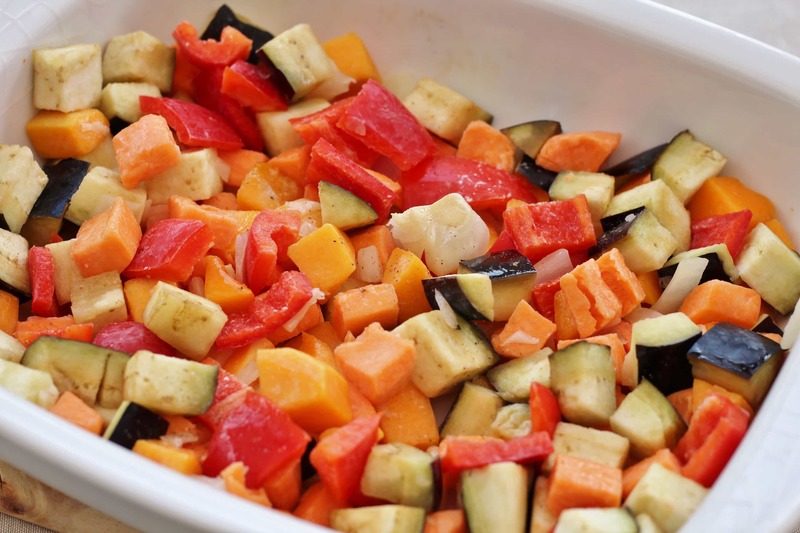 When the oven has reached 200C, remove the roasting tray from the oven and add the chopped onion, butternut squash, sweet potato, aubergine and red pepper. Sprinkle over a little salt and pepper. Stir thoroughly to coat the vegetables in the coconut oil. Put the roasting tray back in the oven and roast for 10 minutes. 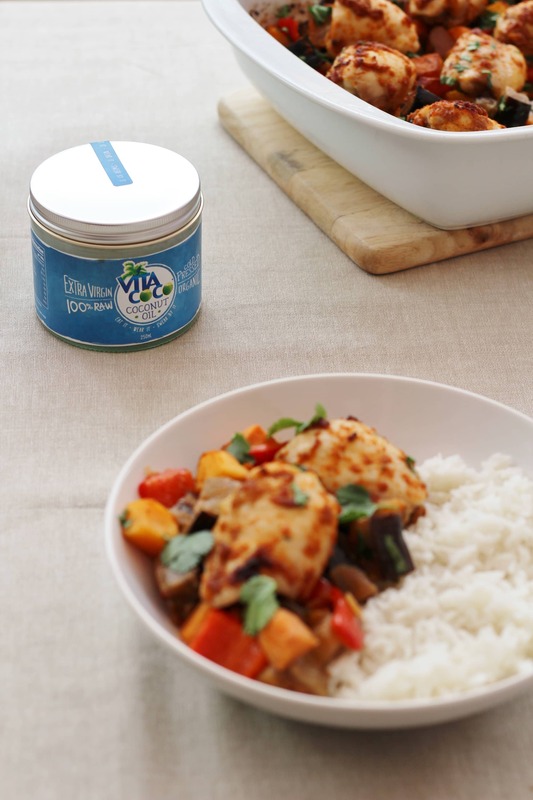 Next, melt the remaining 2 tablespoons of Vita Coco Coconut Oil in a small saucepan (or microwave) until liquid but not bubbling. 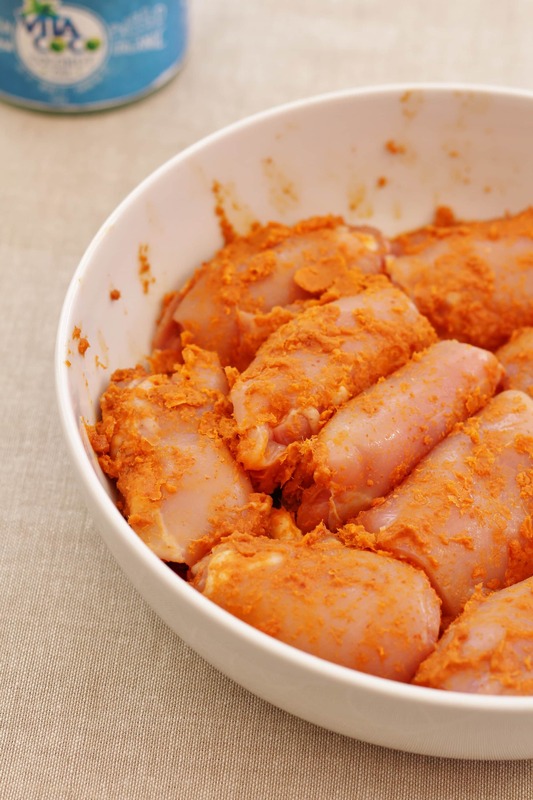 Take the coconut oil off the heat and add the 2 tablespoons of red curry paste. Stir thoroughly. Spread this paste evenly all over the chicken thighs. After the vegetables have been roasting for 10 minutes, remove the tray from the oven and give the vegetables a stir. Then place the chicken thighs on top and put the roasting tray back in the oven for a further 30 minutes. Ten minutes before the chicken is ready, cook 300g rice according to packet instructions / your own preferences. 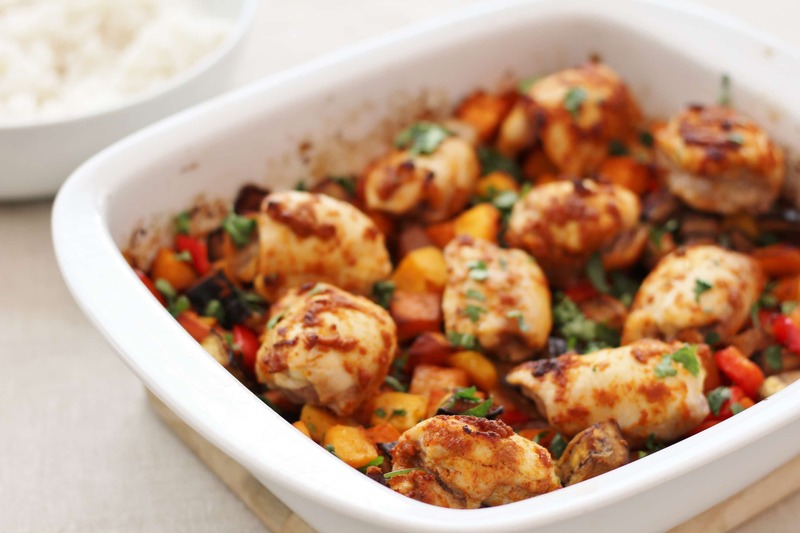 When the chicken thighs have been in the oven for 30 minutes, cut into one to check it is thoroughly cooked (if not, return to the oven for 5-10 minutes until the chicken is cooked through), then remove the tray from the oven and sprinkle over the chopped coriander. Serve with basmati or jasmine rice and a glass of Gewurztraminer or Riesling. 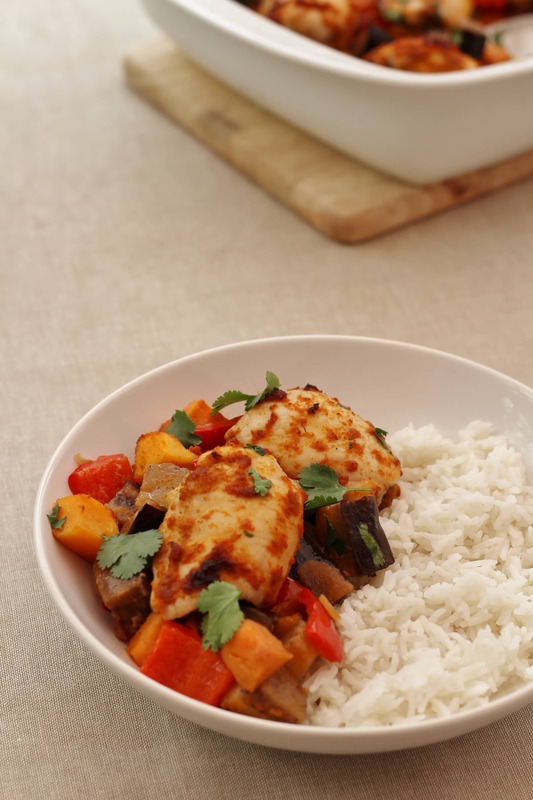 A lovely way to use coconut oil and such a great colourful dish. I think so far I’ve only used it in sweet dishes – it’s perfect for granola! I need to branch out a little and try it with some savoury ingredients! Eb, this worked really well. Simple to do but with amazing flavours. Served it with jasmine rice – and the stickiness and subtle fragrance of the rice really complemented the flavours. Added bonus was the house smelt wonderful with the aroma of coconut! I’ve used coconut oil quite a lot in sweet things but I haven’t gotten around to trying it in anything savoury yet. I really must get on with it. I love the sound of all of the flavours in this, I bet it tastes yummy! With nut allergies and egg intolerance and generally some hard to please family members, I was curious to see how this recipe would work out at home. For clarity Coconut is a seed not a nut and therefore safe for my daughter to eat! However, she can be intolerant of even slightly spicy foods, so I was curious how she would response to the red curry paste. All I can say is success all round! Everyone truly loved this and I have been told I can produce this dish again and again! Thanks so much Eb for an easy dish for a hard to please crowd! !